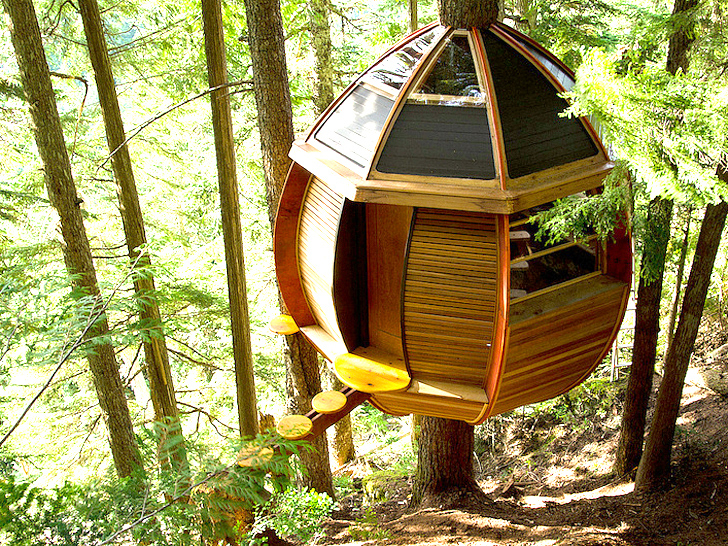 Few tree houses have as much of a back story as the beautiful egg-shaped HemLoft designed in part by Joel Allen on a discreet patch of land in Whistler, B.C. After a social media startup he worked for shut down and subsequent efforts to retire at 26 failed, Joel began to take long walks through the woods with an old hippie named Old Man John. Eventually this led to the decision to build a really amazing treehouse. Trouble is, Joel didn't have money or land, so he used mostly free materials from Craigslist and built the structure on property that didn't belong to him. Lovingly constructed over a period of several years with mostly recycled materials and help from friends, the HemLoft is truly one of the most perfect treehouse designs we have seen over the years, and we have seen a lot of tree houses. After building a model to test its strength, Joel and his architect friends made the egg-shaped mini-home a little broader in order to increase the interior space. Nifty pop-up windows provide light and ventilation. Joel kept this project a secret for three years, certain that Canadian officials wouldn’t be thrilled to learn that he was essentially squatting on land that borders a very wealthy neighborhood, but he eventually contacted Dwell Magazine, which was the first publication to break the story. The HemLoft has its own website now, which we urge you to visit, because there’s even more to this heartwarming tale – including love! Plus, Joel is looking for advice. What should he do next? He should make go to a bank, present a business plan, get a loan, then become a tree house bukmder. 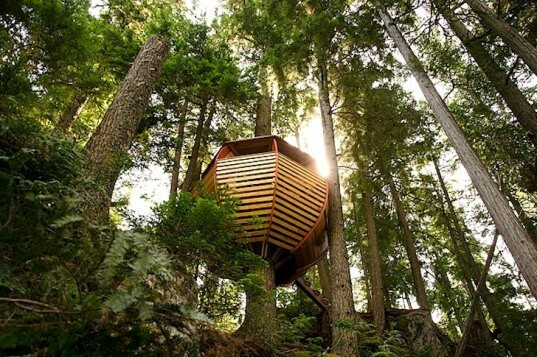 Joel Allen built this HemLoft treehouse in the woods of Whistler, B.C. Contact Joel over on HemLoft.com and tell him what he should do next!